The anticipation leading up to my second cruise—to Alaska—nearly killed me. The day my travel documents arrived from Princess Cruises I raced home, plopped down on my living room couch, and read through them page by page. I booked my shore excursions, memorized Sapphire Princess’ deck plan, read member reviews on our sister site Cruise Critic, and researched our beautiful 49th state online and in travel books. What especially intrigued me about visiting Alaska next was the sheer vastness of it. I knew that Alaska was big (more than double the size of Texas and one-fifth the size of the entire continental U.S.). But I couldn’t grasp exactly how big “big” was … or what the difference was between a glacier and an iceberg … or how breaching whales looked and sounded. Most importantly: What on earth should I pack for Alaska’s northerly climate? Alaska certainly met my expectations size-wise (it’s huge! ), but there were plenty of things that took me by surprise both on and off the ship. Icebergs. Glaciers. Black bears. Brr, it’s cold, right? Not always. I’d read that from June through August, average lows and highs in southern Alaska (where the ships are) range from the 40s into the 60s—and that lows as cold as the 20s have been reported. So I duly packed sweaters, sweatshirts, wool socks, and a colorful poncho for the rainfall I was also promised I’d encounter. And wouldn’t you know I visited Alaska during a precipitation-free, record-breaking heat wave! Temperatures soared above 80 degrees every day (that month, in fact, an all-time high temperature of 93 degrees was recorded on Alaska’s Annette Island). At least the locals seemed to be as shocked and confused as I was. After a few hours attempting to explore Ketchikan in long-sleeved shirts and pants I felt as if I was about to pass out, so I hoofed it back to the ship for a dip in the pool—a dip in the pool in Alaska, with snowcapped mountains as my backdrop. Unbelievable. Thank goodness I packed a bathing suit. Admittedly this is uncommon, but it’s still wise to be prepared for varying degrees of weather, as the climate can change rapidly here and temperatures plummet in the evenings. Next time, I will pack for all seasons and maybe even see some of that rain! I’d considered Alaska to be a bit of a “mature” destination (most of the people I knew personally who’d been there were grandparents and/or senior citizens), but the minute I boarded ship I realized I had it all wrong. There were lots of children onboard, mostly school-aged, and they all seemed to be having a grand old time. The biggest surprise was seeing so many multi-generational groups—families, and older folks traveling with their children and grandchildren. Alaska is a great choice for families who want to introduce their kids to nature and science—something other than the surf-and-sand experience. And it certainly helps that Princess (and other Alaska-going lines like Royal Caribbean and Carnival) offer innovative and extensive children’s programs and facilities to cater to the one million kids who hit the high seas each year. On my sailing, organized onboard activities for children included a “Wizard of Oz” sing-along, and—more destination-specific—an “Edutainment” whale-watching program. A word of caution, though: Sunrise is as early as sunset is late—day broke as early as quarter to four in the morning on my cruise. If you have trouble sleeping when it’s light outside, pack a sleep mask. Even blackout curtains on cruise ships can let in some light (unless, of course, you are in a pitch-black inside cabin). I love sleep and can do it anywhere, anytime, but I can certainly imagine the brightness being an annoyance to those less fortunate. One of my favorite cruise jokes begins with a passenger asking the captain, “What side of the ship will the whales be on?” Yet as silly as that is, I, too, wished I could stand in some magical spot and see whales breeching, eagles soaring, etc. Unfortunately, nature is unpredictable, and in seven days I saw absolutely nothing. If getting up close and personal with nature is important to you, I highly recommend booking an excursion specifically dedicated to whale watching, or another animal-intensive tour. Holland America‘s excursion roster includes an Alaska Bear Adventure by Floatplane, where cruisers are flown to a more remote area of the rainforest known for abundant wildlife; if you are staying overnight in Juneau, Carnival offers an exciting Evening Whale Quest aboard a high-speed catamaran through Stephen’s Passage. There are still no guarantees, but fellow cruisers who took the gamble on Princess’ excursions did not return to the ship disappointed. On most big ships, there are essentially two Alaska cruise itineraries—the Inside Passage and the Gulf of Alaska—and both offer opportunities to view glaciers up close, with sail-bys to Glacier Bay, Tracy Arm, or College Fjord. Whichever you choose, the scenery is breathtaking. Towering mountains capped with ice and snow set the stage for blue glacial ice and the occasional family of seals (if, of course, you are lucky enough to catch them). In Alaska, more than any other region I’ve cruised before and since, excursions are truly the way to experience the region. 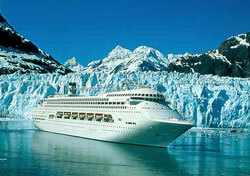 Surely, Alaska’s ports of call have their own charm. Ketchikan features totem poles and funky boutiques. Sitka boasts a rich Russian and Tlingit heritage. Skagway has been restored to its Gold Rush roots and has a real Wild West feel—and a population of just 800. But some things you just can’t experience without ditching the crowded streets and made-in-China trinkets for an organized tour. I’ll never forget sitting up front with the pilot in a floatplane as we soared over the meringue-like peaks of Taku Glacier, then feasting on a salmon bake at a wilderness lodge reachable only by air. I also went fishing just outside Skagway. The actual fishing part of the day was a bit of a flop—I caught some seaweed and a suntan, and not one fish (surprise, surprise)—but the lake was exactly what I imagined Alaska to be: peaceful, untarnished beauty. The jet lag’s not over yet: Depending on where you sail from, you may cross time zones while at sea! Read your daily bulletin for information on time differences, and be sure to synchronize your watch with the ship’s time. A glacier is an accumulation of ice, air, water, and rock debris or sediment; it is a large enough quantity of ice to flow with gravity due to its own mass. Meanwhile, an iceberg is a mass of ice found floating in the ocean or a lake, often formed when ice “calves” or breaks off from glaciers into the water. When a large whale breaches (jumps high out of the water), the “slap” as they come back down can be heard for up to a kilometer!